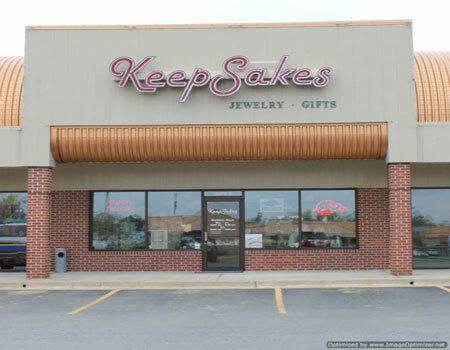 KeepSakes Jewelry is family owned and operated and has been proudly serving the White Hall community and surrounding areas since 1998. Founded by David and Jane Judkins, KeepSakes has established itself as a leading jeweler offering the latest in technology combined with old world craftsmanship. As a direct diamond importer, David travels to Antwerp, Belgium, the diamond capital of the world, to hand pick diamonds for the store and for its customers. Buying direct from this major diamond cutting center provides unprecedented selection and value. David is a graduate of Trenton Jewelry School. He and Jane have many hours of training in areas such as diamond grading, gemstones grading and pearl grading. The Judkins and their staff pride themselves on keeping up with the latest jewelry trends and styles. Membership in Jewelers of America, Arkansas Jewelers and Independent Jewelers Organization help them keep themselves current on the latest jewelry news. At KeepSakes, we have a jeweler on site with over 13 years of experience and strive to achieve the highest quality of work. We offer insurance appraisals, in house jewelry repair, watch batteries, expert watch repair, on-site engraving and many other services. For your convenience, we also offer layaway and financing through GE Capital. Our experienced staff is always willing and ready to help you find the perfect gift whether it is aluminum ware, crystal, diamond jewelry, or the perfect Razorback item for the sports fan. We also offer custom gift wrapping service. KeepSakes Jewelry carries the finest selection of loose diamonds, semi-mounts, pearls, gemstones, sterling silver, pre-owned Rolex watches and all types of fine jewelry. We even manufacture jewelry at our store. KeepSakes Mission is to provide unparalleled service, fair pricing and an outstanding selection of exquisite quality merchandise for its customers. Please visit us soon and experience the KeepSakes difference.